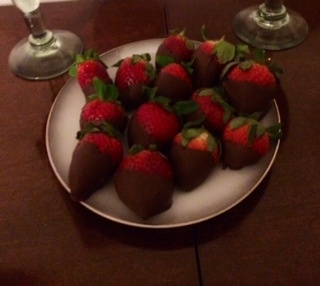 Chocolate covered strawberries are a natural for Valentines Day. Adding chocolate to the juicy, sweet yet tart flavor of a strawberry takes it to another level. Making chocolate covered strawberries is so easy that you should make it for that special person every Valentines Day. Usually around Valentines Day, I can find Florida grown strawberries from a local specialty foods store and this year was no exception. I used Florida grown berries in this recipe today. I find them to be tastier than the ones grown in California. Gently wash the strawberries and very carefully completely dry them. In a microwave-safe bowl, melt chocolate chips in the microwave until melted. Be sure to stir the chips every 15-30 seconds to prevent burning or scorching. Remove from the microwave and stir to make sure completely melted. Carefully grasp the stem or leaves of the strawberries and dip into the chocolate and swirl in chocolate to partially cover. Give the strawberries a gentle shake as you take out of the chocolate. Place the strawberry on a prepared cookie sheet lined with tin foil. Repeat with the remainder of the strawberries. Allow the chocolate to harden. Enjoy.